Running is the best way to lose weight and keep oneself fit. When you run for 10 to 20 minutes, your body will start sweating. The sweat contains excessive salts, water, and harmful chemicals. According to Stanford University, running slows down the aging process of body cells. There’s no denying that people who run for up to 30 minutes every day have a great physique and strong immune system. If you don’t drink enough water during or after a vigorous activity, you may suffer from dehydration. This is because 99% of the sweat is made up of water. Although the water reminder apps will help you stay hydrated throughout the day, the applications won’t track your activities. Note: To use the apps we’ve covered below, your mobile phone must have a gyroscope or proximity sensor. In case your phone lacks one of these two sensors, turn on GPS and data connection. 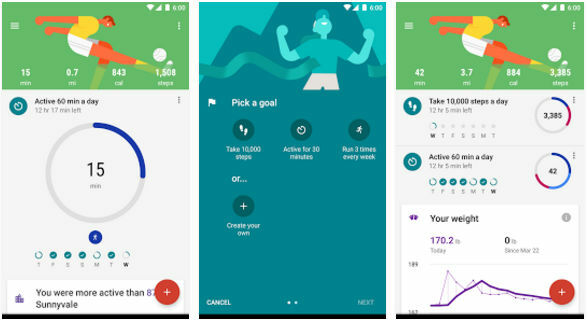 Google Fit is an easy to use activity/fitness tracker app that can track almost all activities of human beings. It tracks the distance the users have run and walked. It also monitors the user’s average running speed, route, etc. GF is a lightweight application. Hence, it won’t drain the battery of the phone rapidly. 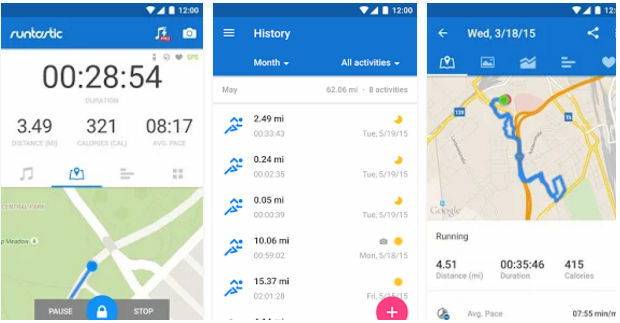 The running app doesn’t simply record your activities. It uses the recorded data to generate interesting graphs about your health. You must go through the reports and work on your weaknesses. GF allows you to set fitness goals. Once you set a goal, you must work hard to accomplish it. GF can import your fitness data from other popular apps and devices running on the Android Wear platform. Google Fit saves your health data online. Hence, if you own multiple devices, it will let you access your data and health reports on each device. Runtastic is a popular running app that gives you access to health tips shared by 100000+ fitness freaks. To get started with Runtastic, users must sign in to the app with their FB or Google account. Then, they must enter their weight, height, age, and country. Runtastic supports live tracking. When you enable this feature, you can share your fitness data with friends on Facebook. The app features a countdown timer. It tracks the distance you have covered, calories you’ve burned, and your average pace. It also displays the route the user has taken. Runtastic lets you capture photos when it is active. Images taken with the application are accessible only through it. Runtastic provides a smart lock feature which ensures that app won’t stop tracking your activities when you accidentally touch any of its buttons. This feature comes in handy when you put the phone in trousers/jeans, bag, etc. Runtastic supports GPS tracking and it has an inbuilt music player utility with which you can listen to your favorite tracks while working out. 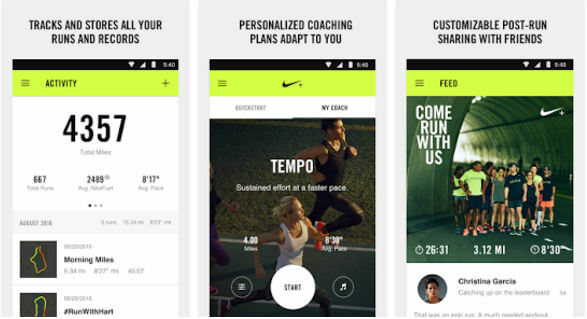 According to the Play Store and iTunes, NRC is the 2nd most popular running app. Google Fit is at the 3rd position. NRC employs the MotionX algorithm to collect the user’s health data. The algorithm reads data from the phone’s proximity sensor and GPS and processes it. Like other running apps we’ve shared in this article, Nike+ Run Club has a nice interface and it provides an option to disable the buttons. NRC features a leaderboard module. Hence, you can compete with your friends. To make sure that you don’t hurt yourself while running, Nike+ Run Club features a guidance and training section where you’ll find effective tips shared by experts. To inspire the users, NRC features a feed section that contains videos and stories of influential athletes. RDT+ is a good alternative to the above running apps. It maintains a log of your running activities so that you can go through the previous statistics and get inspired to run more distance at a faster speed. 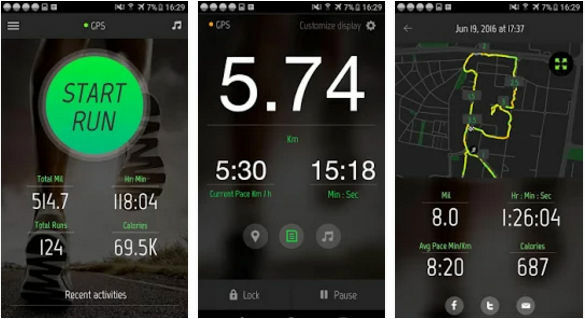 The app lets users listen to their favorite songs and view the route they’ve taken while running. RDT+ provides a settings panel where you’ll find an option to change the distance, speed unit, enable/disable the voice guide, and choose a layout for the main interface. If you’re using a smartwatch/activity tracker with heart rate sensor, the Running Distance Tracker+ can get your current heart rate from the device via Bluetooth. RK is a running app with a beautiful interface. When you run it, Runkeeper prompts you to enter your height, weight, birthdate. Then, it asks you to enable location access permission for it. Once you provide the GPS access permission to Runkeeper, the app will open its main window where you’ll find your location on the map, option to select the activity type, open music player, and enable/disable the audio stats function. 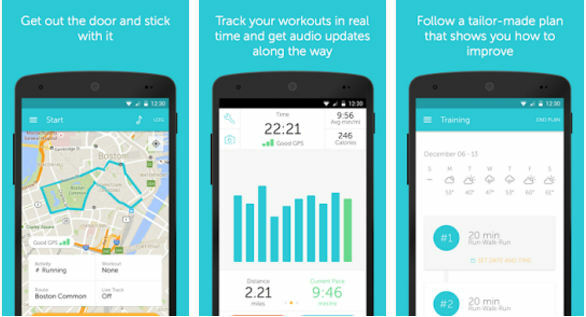 Runkeeper enables users to track workouts. It has an option to set goals. It lets you compete with friends. The app allows you to create groups. You can invite other fitness enthusiasts to join the group and have a discussion with them. Runkeeper supports Bluetooth-enabled wireless devices. It allows users to view their routes. It includes an option to share the running data on social networks. Conclusion: The above running apps for Android and IOS devices provide many features. They use the GPS module of the mobile device to track the distance you’ve run or walked. If you want to get your body back in shape, use the above apps.